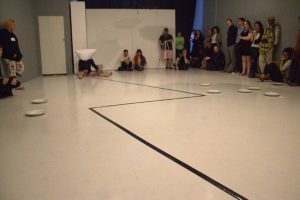 From the unspoken between feet and head – in conversation with the medium’ is a first of all a performance which deals with the notion of signs, codes and origin of their disappearance. Based on statements with a certain poetry and philosophical dead-ends, ‘From the unspoken between feet and head – in conversation with’ attempts to drive the thin border between an outspoken fact, it’s visual appearance and disintegrating in the unconscious. 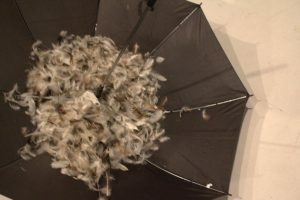 It seeks to mark a starting point in a lately and an ongoing conversation between the corners of performance art and psychoanalytic, both with their hands in the unknown and their search for a risky expression of the inexpressible. But ‘From the unspoken between feet and head – in conversation with the medium’ is also a reflection on performance art from the vantage point of the present. This young art form is already overfloated with cliches and standards, with „must have’s“ and „must seen’s“, often with the longing for the big show. Therefore I created a course which leads to a certain point and leave than the decision about the ending of the performance to the audience. Here I suggest three alternative finals from which they can choose. The first is announced as „political, but unnecessary oversexed“, the second as „autobiographical, but unnecessary suffering“ and the third as „reflection on performance art itself, but unnecessary overcritical“. By majority voting the end is decided (here it was „political, but unnecessary oversexed“) and the performance follows this path to finish. Another idea behind this way of creating a „three alternative course performance“ is also my believe, that every issue and subject can be represented by the same material, even the same actions, which are carefuly composed and placed in something like a „universal template“. If this framework is well done, it starts to flicker and adjust according to the content automaticaly and by nature. Saying if the vehicle is stable and flexible, simple and complex, poetic and straight; it can take any passenger, any content.